No Yves, it is not taken in what we normally think of as a museum. Put it this way - the building's original purpose was not for use as a museum, but over the years circumstances are making it into one, although of a very specialised nature. Mark, is that an offer? Oh boy, does it need it! Did you take it during your travel onboard K.O IN 1990? In case it could be the gamle Bergen museum ( a museum but in a different way). Yves, my apologies, I forgot to add the note about attributing the photo later. Will do so next. No, this is not my photo and was taken many miles from Bergen. She is probably a long way from Bung.y then. The world is her playpen on the web. Looks dark and dingy, but is that a prayer mat on the floor?? I can neither confirm nor deny that it is a prayer mat, especially as there is what appears to be a kneeling cushion (hassock as we would call it in a church) on the floor. But this is not a religious building per se. The wall with its motif of three triangles makes me think of a coranic school in western Africa. It could be "la bibliothèque des sables" (the library of the sands) located in Chinguetti, in Mauritania, UNESCO heritage. Here is the English Wiki page. Yves, congratulations for ID-ing this so swiftly. I really had expected it to last longer because, other than the three triangles you saw and which I admit had no particular significance for me, there was not a great deal to go on without further narrowing down. I had not known about this place or its libraries until roamimg around Wiki, but it has a fascinating history and now a sad one, with the encroaching sands slowly obliterating so much. So often have I wondered about the Sahara and what lies beneath the sands. We excavate sites buried beneath soil and therefore more easily accessible, but if attention were paid to desert regions a whole new world would be opened up. When my Aussie friend took me hunting in WA to look for my uncle Will's telegraph station at Mundiwindi - or what little of it might remain - I saw a photograph of the station at Eucla, the eastern end of the Nullabar desert. There is a photo here and it shows it gradually being obliterated. Will worked there for a time, we think, and I have a photo of him ready to set out along the lines with his camel train, possibly from Eucla. Now, the baton for the next puzzle is in your hands. It was a good one Ivy.After my try with Bergen, I remembered a photo of Théodore Monod with those triangles in the background.So it became easy to find the right place. No,no, it's not a UFO. But what is it and where can you see it?That is the question. Another arty-farthy place somewhere in France is my first guess?? Absolutely.France is the right place. Yves, some time ago you visited an exhibition of modern building designs, I think it was in France. You posted photos of some of the plans on show but also images of some of the actual buildings outside. I have been trying to find your posts but without success so far. Is this puzzle one of the erections you saw? You didn't post it on CVF, I know. I think it was in Bordeaux.On about Caen thread. 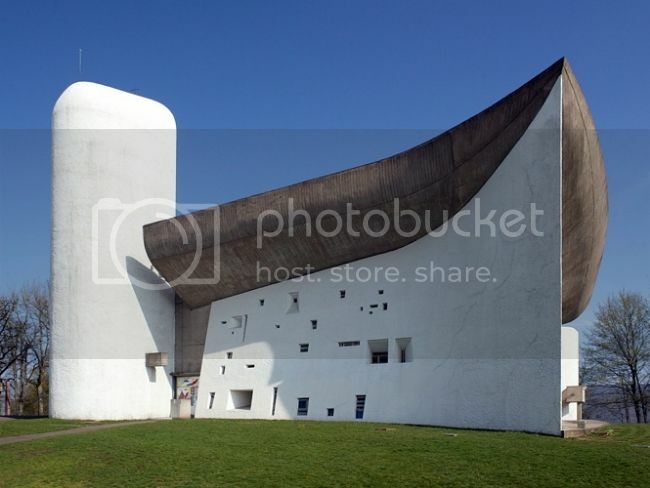 When search for Art Centers in France failed, I just typed "modern french architecture " into the search box and there it was, with plenty of other pictures of this chapel from different angles. PS> I noticed that Yves have hidden the cross on top of the tower to lead us astray. Yes it is the chapel of Ronchamp.Well done Ombugge. I have posted the original picture and I didn't hide anything.Don't know why the cross does't appear. Without more ado, here is next puzzle. Traditional first question:Is it in South East Asia? Yes it is, but where??? It appears as a busy area with a lot of cranes in action.Did you take this photo recently? I was thinking about an extention of an airport on the sea. Picture taken one week ago today. Cranes yes. but no airport construction involved here. Not the Chinese construction projects in the South China Sea, if that was what you were thinking? I think it must be in or near Singapore, where ombugge lives. Near yes, but it depends on your definition of "near". To most people not from the region, anywhere in Asia is "near" Singapore, apparently. Conversely, to a Singaporean anywhere off our little island is "overseas", or in the older days, "outstation". Even if on the island, things are described as "oh, very far lah". 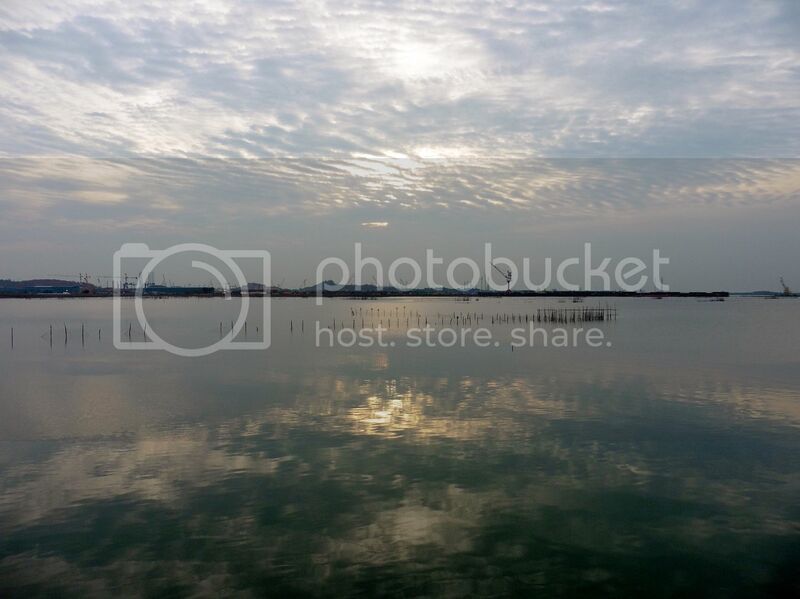 Sembawang or Jurong are examples of such far away places, when seen from the down town area.